1. Short for mandrel assembly, this tool is a part of the rotary-draw tube-bending process. It controls the flow of plasticizing material at the point of bend in order to maintain the shape of tube as it sets into the arc of the bend. If the tube wall is thick enough relative to the overall size of the tube or if the specifications are not too severe (e.g., shallow depth of bend or a large “D” bend radius), then a mandrel may not be necessary, because the force of the bend is not sufficient to buckle or collapse the tube wall at the point of bend. However, if the wall factor of a tube exceeds 20, a mandrel is needed in most instances. The key to effective use of the mandrel is to set its nose so that it supports as much of the point of bend as possible. This ensures that the vertical cross-section of the arc of the tube bend, while it is in a plastic state, will take the shape of the nose as the tubing material is drawn over it. 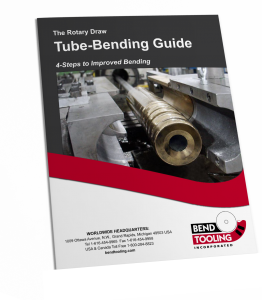 This plastic region of the tube bend extends both behind and ahead of the line of the tangency, therefore, the mandrel nose must be set forward of the line of tangency into the arc of the tube bend in almost all cases. The limiting factor of this forward placement is the point where the outboard line of the mandrel intersects with the tube wall of the outside radius; in other words, the point where the mandrel nose would literally stick out past the bend. The location of this point can be determined by formula developed from the Pythagorean thereom. Generally it is advisable to locate the nose (excluding the nose radius) about the two-thirds of the distance between this point and the line of tangency. This will allow for slight flattening of the tube’s cross-section at the outside radius, which unavoidably occurs because of the tension of the draw, without intersecting the mandrel nose. 2. The mandrel body or shank, particularly in reference to a non-inserted mandrel assembly. 3. A plug, i.e., a mandrel that does not require a ball assembly.